Former Rangers goalkeeper Andy Goram has urged chairman Dave King to back manager Mark Warburton by providing transfer funds in the summer. Goram believes Rangers can challenge for the Scottish Premiership title next season - if the squad is strengthened. He says King has to support Warburton to allow him to sign the "four or five players" the squad will require. "Dave King has already said in public that he has £20m to spend. He's got to come and do it now," Goram said. "The players [Warburton] has brought in - Wes [Fotheringham], [James] Tavernier, [Martyn] Waghorn - have hit the ground running. He knows what he's doing. "The big thing for us is if we manage to win the cup final (against Hibs) and get into Europe, because that will attract a better class of player. "[Accrington midfielders] Josh Windass and Matt Crooks are coming already, so if we could sign another three, four or five then we've got a right chance next season. "We've laid down a wee marker [by defeating Celtic in Sunday's Scottish Cup semi-final]. That doesn't mean we're going to win it next year, but we've planted a seed and with Celtic in a bit of turmoil just now, it looks as if the tide has turned a wee bit. "The gap's not that big. Celtic haven't been great this season, but we're not the finished article either." Goram was impressed with Rangers' performance in the penalty shoot-out win over their Old Firm rivals. 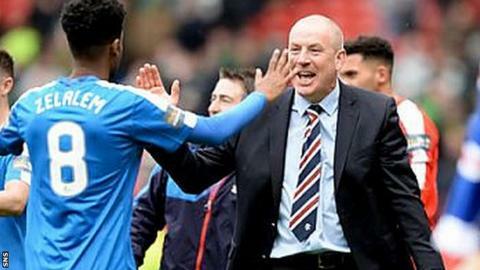 He saw it as a reflection of Warburton's talent as a manager, and insists the Englishman will want to finish the job he has started at Ibrox rather than return south early. "People say Celtic didn't play too well, but I thought Rangers made them look not too great," Goram added. "Rangers were brilliant. Individual performances were fantastic but as a team we had a great game. Mark Warburton got it spot on and we did a wee turn on them. "He reminds me so much of the [former Rangers] gaffer, Walter Smith, the way he goes about it, the way he speaks. He's got that calmness, he knows what he's doing. "His stock has gone up with what he's done this season and the way he's gone about it, but he's got a job to finish and I think he looks at it that way. "I can't see him going anywhere next season. He'll stay, hopefully get into Europe and have a right challenge at Celtic. "I think that's what he came for, he's brought all these players in with him and he's bringing in more, so there's no point walking away."